This year’s conference saw strategic collaboration of several partners including from left, Hong Leong Islamic Bank, Echo Foxtrot Sdn Bhd (Bungkus by Honestbee), McDonalds Malaysia, Ainul Azman Ainul Jamal, Vice President, Corporate Services, HDC, Hanisofian Alias, Vice President, Industry Development of HDC, Nestle Malaysia, Hairol Ariffein Sahari Vice President, Strategic Planning and Monitoring, HDC, Salam Web Technologies MY Berhad, Association of Islamic Banking Financial Institutions Malaysia (AIBIM). 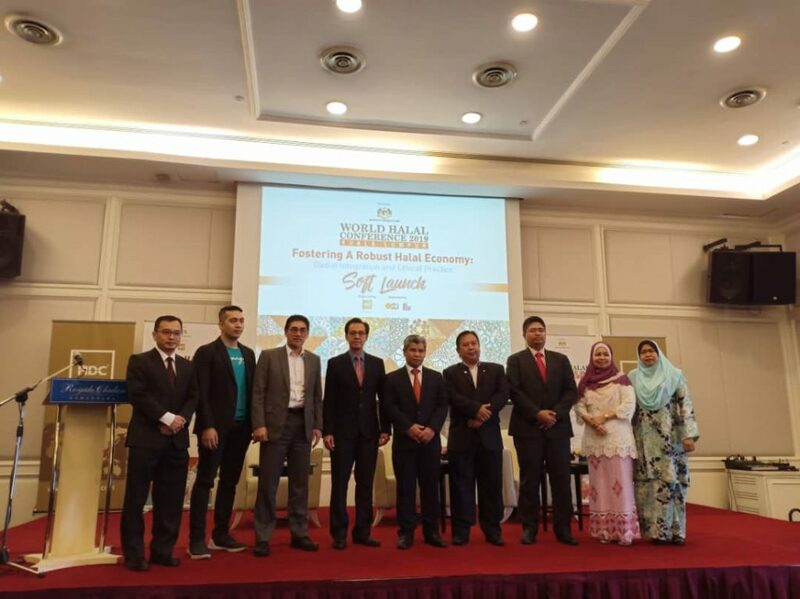 KUALA LUMPUR – The 11th World Halal Conference 2019 (WHC 2019) is one of the Government’s concerted efforts to propel the international growth of the halal industry, and to make Malaysia a thought leader in the development of Halal industry. Organised by the Halal Industry Development Corporation (HDC) and hosted by Ministry of Economic Affairs, Malaysia, WHC 2019 converges more than one thousand Government representatives, business leaders, halal industry players, entrepreneurs, scholars and stakeholders from all over the world to explore the potential and deliberate on challenges relating to the development of the halal economy. services. Halal is accepted as a truly global industry and this ever- increasing globalization represents a vibrant opportunity for the global economy. 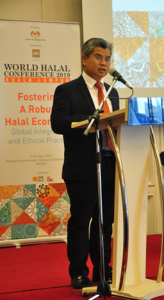 However, it also presents a number of challenges, to do with international attitudes and rapid technological change; and it entails important responsibilities concerning the ethical governance of the halal industry and its harmonised regulation worldwide. Building on this premise, this year WHC 2019 will feature the theme ‘Fostering a Robust Halal Economy: Global Integration and Ethical Practice’ to explore opportunities and challenges through series of discourses aimed at integrating technological advancements, ethical governance and emerging market, through a plethora of topics on the progressive impacts the Halal Economy offers during the sudden borderless surge in global integration and within the technological industrial revolution. The two-day conference will be packed with multi-level discourse addressing various opportunities and challenges in the Halal industry will be championed by: YB Dato’ Seri Mohamed Azmin bin Ali, Minister of Economic Affairs Malaysia. This year’s conference saw strategic collaboration of several partners including, Hong Leong Islamic Bank, Duopharma Biotech Berhad and Salam Web Technologies MY Berhad, Nestle Malaysia, McDonalds Malaysia and Association of Islamic Banking and Financial Institution Malaysia (AIBIM). “We are honoured to see such strong commitment from our industry partners, together with the participation of foreign delegates and renowned speakers who will make this year’s conference a success. We urge for their continuous support; together we can take the Halal Industry to new heights, both internationally and locally,” said Mr. Hanisofian Alias. On Malaysia’s halal performance, he announced that the country’s total halal export value in 2018 amounted to RM40.0 billion, a decrease of RM3.3 billion (7.6%) from the previous year. The halal sectors saw a setback in exports in overall cluster with the exception of the cosmetics and personal care. Overall, the reduction in halal exports last year were largely contributed by two halal clusters represented by a 50.0% (MYR1.8 billion) decline in palm oil derivatives from MYR3.6 billion the year before and 36.7% drop in industrial chemicals to MYR357.77 million in 2018 from MYR563.54 million previously. The top importers of Malaysia’s halal products were led by Singapore (RM4.6 billion); China (4.5 billion); Japan (RM2.5 billion); the United States (RM2.4 billion); and Indonesia (RM1.9 billion). Although it was a challenging period, Malaysia remains resilient and continues to thrive, capable of withstanding these challenges, and progress forth as a Global Halal Hub aspirant through sustainable Halal ecosystem approach related in the Halal Industry Master Plan 2019-2030 (HIMP2.0). « Halal, health and healing: Will halalopathy bring hope to patients?